CHITWAN, Nov 29: There are various community forests within Bharatpur Metropolitan City, which is adjoined to the Narayani River. These beautiful forests full of lush green trees and herbs shelter a large number of rhinoceros. Community forests like Majhuwa, Gyaneshwar, Setidevi, Siddhiganesh and Narayani fall in this area. It has been more than a decade since these rhinos started troubling the locals by entering the human settlement. They do not just scare people but damage crops and vegetables, according to Surbir Pokharel, former chairperson of Community Forest Users Group (CFUG), Chitwan. Earlier, rhinos used to enter the settlements freely, spend their nights in the fields and return to forest before sunrise. In order to prevent the rhinos from entering the settlement, the local authorities have set up electric fences. "We have installed electric fences in Majhuwa, Siddhiganesh, Setidevi and Gyaneshwar," said Pokharel, adding, "Now, rhino's don't dare to enter from those areas due to the fear of being electrocuted." Instead, they have changed their routes and have started entering from other areas. 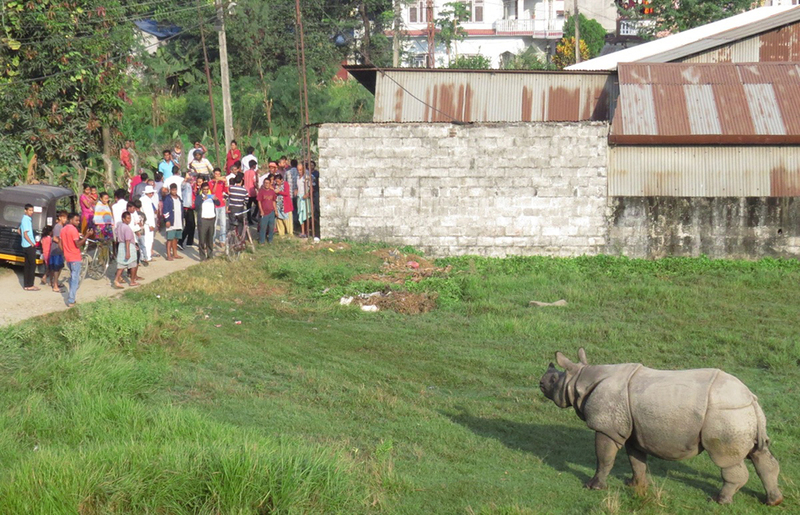 Lack of food in their habitat compels rhinos to venture into the human settlements. These rhinos are especially found wandering in the fields of ward numbers 3, 4, 15 and 16. "In the past, rhinos used to come here only during dry season but these days they are found wandering here all time of the year," Pokharel added. There are days when three rhinos enter the settlement together. Locals have to adopt various tactics to chase them away. Mitra Pandit, chairperson of Bharatpur-3, stated that management of wild rhinos has become a serious problem here. "Now, we have become used to seeing rhinos in our fields when we are out for morning walk," said Pandit. Though they feared locals in the past, they now roam around in human settlements without any fear. Fortunately, they have not injured anyone this year but that does not mean they have not threatened the safety of people. Ved Kumar Dhakal, conservation officer of Chitwan National Park, says that finding rhinos outside the national park is a matter of happiness but not having effective measures to prevent them from entering human settlements is a serious concern. He urged the people to inform the authorities when they find rhinos in their areas. He stated that efforts are underway to deter the wild animals from entering the villages and cities.